Colossians is one of my favorite letters because of the absolutes. It reads differently than Ephesians, Galatians or Philippians. There are things plainly stated there that resolve certain questions about faith, trust and perspective on how God involves Himself in my little daily affairs. In concept I think we all agree “God first,” or that He comes first in all we do, say and think. But it’s not as easy as we can make it sound/ seem/ appear. 1:16 ~ For by Him all things were created, in the heavens and on earth, visible and invisible, whether thrones or dominions or rulers or authorities — all things have been created through Him and for Him. Whoa. ALL THINGS. Look around your life… thoroughly… and consider ALL THINGS. If it exists it came through God. He had a hand in its creation, and for Him it exists. Wait — that’s a hard saying, right? I can look at my life and declare this or that does not look like God. But ALL THINGS means all things. Truth forces the submission and review of perspective (that is, personal truth) for change. We come to learn that the roots of behavior and thought lie in systems (i.e., those thrones, dominions, rulers, authorities mentioned above) and take a greater God to help us conform to His way. 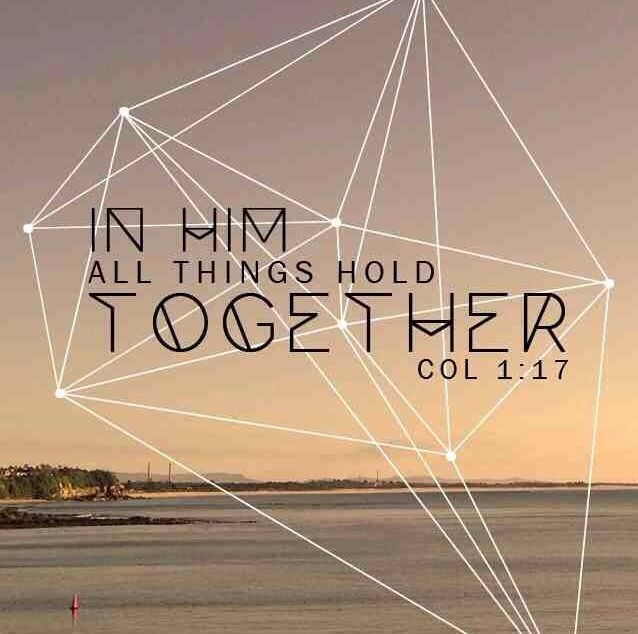 1:17 ~ He is before all things, and in Him all things hold together. 1) God was not before or ahead of or leading it? 2) Is it because I or we did not place “it” in Him for it to hold together? These are simple questions, but heavy… very heavy. 1:18 ~ He is also head of the body, the church; and He is the beginning, the firstborn from the dead, so that He Himself will come to have first place in everything. I grew up thinking that if I put God first then everything will fall into its place. I know this now as the way I interpreted the preaching and teaching I heard. Pay attention to that last phrase of verse 18 — Jesus Christ is the head of the church, the beginning, the firstborn SO THAT HE WILL COME TO HAVE FIRST PLACE. I wish I learned this process early in my discipleship, then my faith might have suffered fewer holes. The battle remains between body and mind, between doing what pleases our flesh and doing what we know God wants (which isn’t always the opposite, but the act of surrender and submission is primary). And in us and the details of our lives, HE COMES TO HAVE FIRST PLACE IN EVERYTHING. Truly, this is sanctification — not what we DO to grow in our knowledge of God, but HOW He comes to be first in all things…HOW we learn to seek Him and His mind and His way for and in all things BEFORE we get snared. So, the investigation and assessment continues. What in my life contributes to my perception that it’s “falling apart,” and where is God in that? What in my life is contained in Christ, so that it’s still holding on, even by labored breaths? Where is Christ behind and not before…so that I see parts of my life outside of Him? We know, as we follow on to know (Hosea 6:3). Selah for real, and love to all.